In september 2000 we made a trip through the Southwest of the USA. 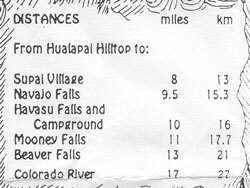 One of the places that made a very deep impression was Havasu Canyon, a lesser known part of the Grand Canyon. Igor and I made the hike in on September 17, spent the rest of the day at the falls and hiked out the next day. Although it is possible to contact the Reservation, most of the information we gathered preparing for this trip we found on the Internet on pages like this one.